Do you suffer from frequent headaches (meaning more than 2-3 per week)? Do they often turn into migraines that are debilitating and make you want to pluck an eyeball out? When you have a headache, everything hurts from your head to your toes. Life is experienced through the headache filter. Every enjoyable event is weighed down by the fact that you have a headache. All of your senses are processing positive memories in a negative light. And don’t even mention the daily tasks. They become overwhelming and sometimes too hard to complete in the midst of chronic headaches and migraines. In my 20’s, I had a headache every day for almost 7 years. I probably had migraines 2-3 times per month. I was put on Imitrex, Zomig, beta blockers, calcium channel blockers. I popped 900mg of Advil without blinking. I took Excedrin Migraine. I had massages, took naps, drank coffee, drank more coffee, iced my head and neck, tried aromatherapy. You name it, I tried it. Things only got worse. I had an MRI…nothing. I was in pain on a daily basis and I was in my 20’s, supposed to be living the best years of my life. The headaches depressed me and stole my energy and my joy. I started to accept that this was just the way it was going to be and I would have to live with it. During this time, I went to go visit a college friend of mine who told me about how she finally broke her own cycle of headaches and migraines. She had been to see a neurologist at John Hopkins in Maryland for her headaches and migraines. He had a different approach than most doctor’s. He treated his patients by eliminating dietary and environmental triggers and avoiding quick fix painkillers that cause rebound headaches. I tried the approach she had followed, and within 2 months, I was also headache and migraine free! I started spreading the word to my family members who also struggled with headaches and migraines and it worked for them as well! Almost twenty years later, I have brought this tried and true approach into my nutrition practice. Stop taking over the counter medications for your headaches. If you absolutely have to take something for a headache or migraine, I would recommend just taking a regular strength Tylenol (acetaminophen) as long as you do not have any other interactions. (Note: Always check with your doctor before starting any new over the counter medication). And definitely, do not take any of the over the counter headache relief medications that also have caffeine in them. They may relieve the pain temporarily, but will forever keep you in the headache/migraine cycle. Stop taking prescription medications for your headaches (ALWAYS talk to your doctor about stopping medications first). Many of these such as Imitrex and Zomig, or narcotics, such as Vicoden, will forever keep you in the chronic pain and rebound cycle. Get the right amount of sleep (not too much, not too little). Anywhere from 7-9 hours. And try to be as consistent as you can with the times you are going to sleep and waking up. Even on the weekends. Avoid Alcohol. Some alcoholic beverages, such as red wine and champagne, contribute to headaches more than others. However, in general, all alcohol is a trigger for headaches/migraines. A high end vodka is probably the best tolerated if you must have a drink. Avoid Caffeine. You may be able to add it back in later in smaller amounts, but you need to get off of all caffeine now. Caffeine is one of the biggest headache and migraine triggers. Right now you may be thinking that I’m misguided. That caffeine helps relieve your headaches. That is a BIG misconception as it is only a quick fix for caffeine withdrawal that perpetuates the headache/migraine cycle. Also make sure to avoid decaffeinated versions of coffee and tea which contain additional chemical triggers. Instead try herbal teas. Avoid artificial sweeteners. Aspartame (NutraSweet), sucralose (Splenda), saccharin (Sweet ‘n Low), etc. These are found in diet sodas, diet teas, flavored beverages, sports drinks, light yogurts, health shakes, protein bars, etc. Stay away from them. Stevia (alcohol free) in the liquid form is the only one that I would say is safe to use. Avoid preservatives, such as nitrites and nitrates. Stay away from processed foods, but especially those processed meats such as hot dogs, pepperoni, sausages, bacon and other lunch meats made with nitrites. Also avoid sulfites found in preserved dried fruits and alcoholic beverages, especially wine. Avoid monosodium glutamate or MSG. MSG is often used as a seasoning in snacks, processed foods, vegetarian meat substitutes, soy protein concentrate/isolate, broths, soy sauce, etc. MSG typically will cause an almost immediate headache for those sensitive to it (which most headache and migraine sufferers are). Avoid chocolate. Chocolate is a common trigger (it’s the cocoa). White chocolate seems to be okay, but white chocolate is not even chocolate technically. The more processed chocolates (think M&M’s), tend to cause more headaches than a “cleaner” product, such as a 90% cacao dark chocolate bar. Other potential dietary triggers are dairy products, tree nuts and peanuts as well as their butters, certain fruits especially citrus fruits and bananas, fresh yeast breads, onions and soy products especially if highly processed. Hydrate, hydrate, hydrate. A minimum of 64 ounces of fluid per day. If you are losing fluid via sweating, exercising, make sure to up your intake even more. Do not go too long between meals and snacks. If you go longer than 4-5 waking hours between eating, your blood glucose levels may drop and this can no doubt trigger a headache or migraine. This also goes for waiting too long to eat after waking up. 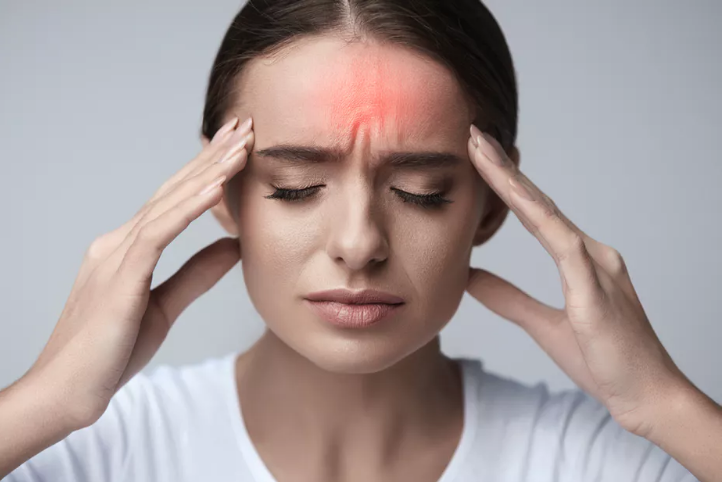 Barometric pressure changes, hormone changes (pregnancy, monthly cycle), environmental exposure to chemicals and pollutants, smoking, medications, stress, eye strain as well as individual food sensitivities can all trigger headaches and migraines. Do the best you can to decrease the triggers listed above. Track your food and beverage intake along with your symptoms. Once you get to where headaches and migraines are under control and you have figured out your biggest triggers, you can slowly start to add back in some things in small amounts. However, caffeine and medications are no doubt the ones to be aware of. They slowly creep back in and the cycle can start all over again. And after being freed from the headache/migraine cycle, you don’t ever want to go down that path again. So here’s to your future being free from chronic headaches and migraines! Annnnnnnd go! Get Rid of Your Headaches and Migraines For Good!